Buildings 12 and 13 currently operate as shared office buildings offering a range of office suite sizes with the ability to combine offices to create larger open plan spaces. Unit 12 is an end terrace industrial / warehouse unit of steel portal frame with brick and clad elevations. The original part of the former Colleys restaurant was a three storey early 18th Century Coaching Inn. A substantial site comprising 4 individual production/warehouse buildings. Units 26 - 27 offer two adjacent industrial warehouse units which are currently joined internally and are available individually or as a whole. The premises are a three-storey retail property with basement storage, ground floor sales area and first floor living or ancillary accommodation. A five storey Grade II listed office building with painted and rendered elevations. 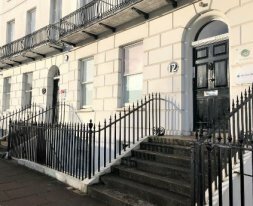 The accommodation comprises the ground floor of a five storey, mid terrace Grade II* listed building with painted and rendered elevations incorporating timber framed sash windows. A self-contained fenced and gated site extending to approximately 1.56 acres with three Industrial buildings situated upon it. Contemporary offices, workshops and studios available for rent. The property comprises a mid-terrace five storey building of brickwork elevations under a mix of pitched and flat roofs. A mainly level site suitable for commercial development use and extending to approximately 19.8 acres (8.01 ha). The property comprises a ground floor retail/office unit with a further office/store, kitchen and WC facilities to the rear. A mid terrace Industrial/storage unit of steel frame construction with facing brickwork profiled cladding to the elevations under a profiled insulated roof. The site forms a courtyard of small industrial units at the end of Shepherd Road. The property will comprise a brand new detached industrial unit of part brick, part clad elevations under a pitched roof with tile covering. Units 7 and 8 are both built with steel portal frame construction, with block work cavity walls topped with profile steel cladding beneath a pitched roof. A small and newly refurbished office is available to rent in Quedgeley, Gloucester. Unit 4 is situated on the ground floor and includes a main office/retail area with WC facilities. The subject property comprises a mid-terrace retail property. The property comprises a mid-terrace industrial unit of brick construction under a pitched roof with tile covering. The property comprises an end terraced three storey period building of traditional construction. The property comprises Grade II Listed property of mid to late 18th Century with 19th and 20th Century alterations. An industrial/warehouse unit of steel frame construction with full height brickwork to the elevations under a pitched and profiled roof. The property is a three-storey building located on a prime retail pitch benefiting ground floor retail accommodation with good frontage. Internally, the property has vinyl covered floors with painted plastered walls and ceilings with spot lights. Ideal for local start-ups and small businesses, the managed office space at Basepoint Tewkesbury comprises 69 small business units. The property comprises a detached industrial building of steel portal frame construction. The properties are modern units of steel portal frame construction with part clad part brick elevations and blockwork party walls. Believed to date back to the early 1800’s, this Grade II listed Villa is accessed from Cambray Place via a stepped central entrance and provides office accommodation over three levels. The property comprises a corner retail unit on the ground floor of an attractive period building. The property comprises a mid-terrace building arranged on two floors with a retail area, kitchenette/staff room and WC on the ground floor. Phases 1 and 2 have now been delivered comprising a total of 25 light industrial units. The property comprises one of a terrace of eight retail units of varying size, constructed in about the 1960s of concrete frame construction with rendered and brickwork elevations under a flat roof. Unit 2 Station Mews forms part of a larger building divided to provide a total of four units of steel portal frame construction. The property provides a former garden centre totalling approximately 0.72 hectares (1.79 acres). Mill Place offers a range of industrial, storage and office premises across two adjacent sites. An attached warehouse/industrial unit of full high brickwork to the elevations. Valiant Court comprises three self-contained office buildings prominently positioned at the gateway to Gloucester Business Park. A well-presented first floor office suite with car parking.